Bobby Barr was delighted to make his return from injury against St Mirren on Saturday after admitting: “It was rubbish watching”. Rovers looked an improved side once the former Morton winger was introduced on the hour mark but despite setting up late chances for his side, Saints held on to claim a 1-0 win. Barr has been out of action since picking up a knee injury against Falkirk on October 22 and he is relieved to back in the fold earlier than planned. “I don’t like missing games,” he said. “It’s the first time in my career that I’ve missed a period of games. 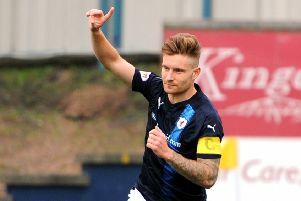 “I’m always playing and I’m always fit but it was just one of those things - a freak accident against Falkirk. “We scheduled to be back for Dundee United or Hibs so I’m a couple of weeks early, and to get half an hour on Saturday was great. It would’ve been nicer if we’d won. “I’m still a wee bit tight but nothing I can’t cope with. I’m delighted to be back involved because it’s rubbish to be sitting in the stands watching. “You want to help team mates and contribute. Despite the result, Barr was pleased with aspects of Rovers’ performance at St Mirren Park. “It’s probably as well as we’ve played recently,” he said. “I’ve been at the games and we’ve huffed and puffed at times, but on Saturday we’ve created chances and made their goalie work - we just need to be clinical. “It’s a wee dip we’ve had recently but we’re still in the play-off mix. After poor displays against Dumbarton and Ayr, Barr revealed that boss Gary Locke has been stressing the importance of keeping possession. “The last two weeks we’ve worked hard in training while we’ve not had a game,” he said. “I only came back on Monday but the gaffer wants us to play football. “He never, ever says to play it long unless we’re winning late on and you put it into corners. “He always encourages us to play football and that’s what he was on at all week. “The boys looked sharp and we knocked the ball about reasonably well - the two in the middle of the park go on the ball, got it wide, and we were direct and positive.